Every once in a while, I’ve had the annoying discomfort of needing to relieve myself in the middle of the night when I am toasty warm, snuggled up in my hammock. It’s happened regularly enough, in fact, that I wondered if the hammock was to blame. In asking around to other hammock users I found I wasn’t alone. Claim #5: Do hammocks make you pee more in the night? The truth is: they actually might. But the problem isn’t just the hammocks fault, and there could actually be a lot more involved medically. In fact, if you are having frequent trips to the bathroom in the night (Nocturia), it is a good idea to consult with a doctor. When I’ve noticed nighttime nature calls, it’s usually when I’ve been out hiking or backpacking. Drinking lots of water to stay hydrated can be somewhat to blame in these situations, but I’ve noticed that even when I drink lots of fluids before bed I don’t consistently have midnight bathroom calls. If my body was truly dehydrated, than it would be absorbing that extra fluid instead of just passing through my kidneys. But drinking too much can be problematic, especially if it is more than the body needs. It is a balancing act. Drinking fluids is important to stay hydrated and even stay warm, since your muscles need water to help burn calories. With too much fluid, expect a rude awakening. Certain drinks should be avoided (coffee, caffeinated drinks, and alcohol most often) because they are natural diuretics and will make you pee more, regardless of quantity. So, one bit of advice is to drink the right amount of the right fluids. But if drinking more is not entirely to blame, what could it be? Fluid buildup in the legs can be one cause, since this fluid settles once you lay down and is then processed. For those who do much hiking and backpacking, edema, or fluid buildup in the legs (and sometimes arms and hands) is quite common. In fact, hikers are often encouraged to rest and raise their legs to the level of the heart to help reduce the swelling, improve muscle recovery, and help the body process fluid buildup (lactic acid, etc.). Now the hammock connection makes sense. Hammocks provide a recumbent-style lay, where the fabric moulds to the shape of your body to create a more comfortable sleep. Your heavier torso sinks down a little and your feet naturally elevate to the level of your heart. It’s quite brilliant. However, if during the day you’ve had some edema in your legs, that excess fluid is now settling and getting absorbed by your body, and in a few hours—probably in the middle of a comfortable night’s dream—you’ve got to go pee. Badly. So, yes; the hammock provides a natural, healthier recumbent lay for your body that helps alleviate edema in your legs and tired feet, but that can have an unintended consequence. If edema is the issue, which I believe it is in my case, the solution is an easy one: an hour or two before bed, elevate the legs so they are level with the heart so that excess fluid can be processed prior to sleeping. This was better explained in another article about hiking and camping, water is a both a hydration system but also a temp regulator in body and so much more. It needs water to both keep you hydrated but also used to regulate temp and as temperatures go up and down so will your need to pee. Agreed. Water and fluids are essential for those core functions you mentioned: hydration, thermoregulation, mobility, etc. I touched on those very lightly. However, you should be able to rest for 6-8 hours without peeing. If you’re peeing more in the night, than something is amiss. There are a lot of causes for excessive nighttime urination, some could be serious (e.g., diabetes, urinary tract infection, congestive heart failure, etc). Non-medical causes include consuming too much liquid, consuming a diuretic before bed, or accumulated fluids are more easily managed. Nice article, thank you. I blame it on my forgetfullness. I go back and forth about 5 times for things I forgot to do. Peeing can be one. And since I drink a tea to help me sleep, if i do not pee before sleep, I can be in trouble at some point. so you just move yourself over to the side of you hammock and pee- then lay back and go back to sleep- no big deal. another advantage of hammock camping when you are not laying on the ground! There is that 🙂 Hammocks have some other advantages. This is a method I’ve happily been using for years with my Clark North Americans. My recent purchase of a Tentsile Stingray has my girlfriend quite pleased as well, that center floor hatch works for both sexes! Let’s not forget that there are those of us who use a CPAP at home for sleep apnea treatment. I happen to have a severe case and while using my CPAP at home, am able to sleep through the night. However without it I can be up 4 to 5 times a night. I have never let this stop me from hammock camping. It is a nuisance though! Some authorities believe that only 20% of sleep apnea affected people are diagnosed. 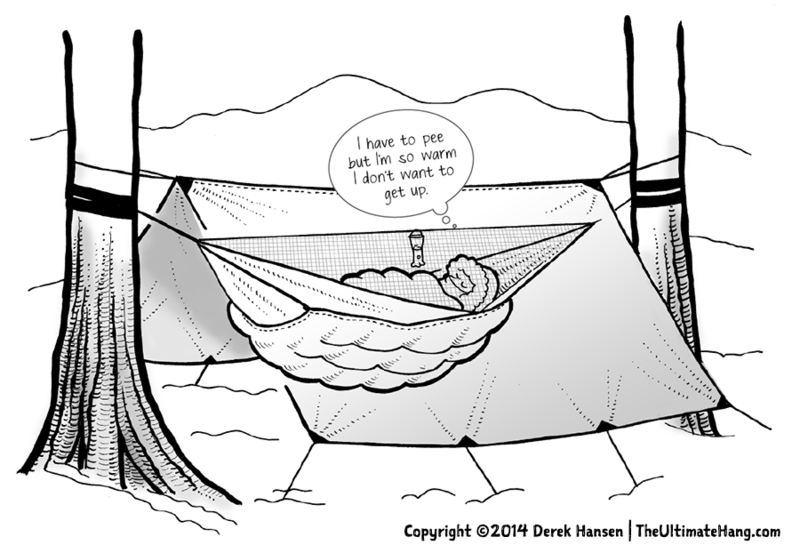 I still notice a difference between the hammock and tent with the hammock having a higher frequency of nature calls. They do have battery powered CPAPs. Mine hangs from my ridge line on a clip. There is also a chin strap that I use instead of cpap that holds your jaw forward and opens your airway. Simple and almost nonexistant in weight. Can you post a link to one of these straps? It sound like something from which I could benefit. When it comes to Hammocks, I like the Caribbean Mayan Hammocks like the ones at http://www.ameriprod.com/category_CMHA_Caribbean-Mayan-Hammocks.html because they are made in the USA and are very durable. What also happens is if you are dehydrated, even slightly, your body will store its waste to preserve moisture. Than at the end of the day when you have replenished your water your body takes time to process it and excrete the stored liquid waste. …And dont forget the caffeine in coffee and tea etc acts as a diuretic which causes you to go more. A pretty recent study showed that coffee/tea does not act as a diuretic for regular coffee/tea drinkers and actually has the same hydrating effects as water. Beer and wine on the other hand will keep you up all night. These data suggest that coffee, when consumed in moderation by caffeine habituated males provides similar hydrating qualities to water. Still, caffeinated drinks can cause headaches and insomnia in some people. Water is probably your best bet to stay hydrated. It’s calorie-free, caffeine-free, inexpensive and readily available. I did say the ‘caffeine’ in coffee and tea. Do your own study drink a caffeinated beverage or two after dinner before bed and see what happens. After all we are individuals and have our own tolerances and conditions that effect results. I have an enlarged prostrate and need to go frequently. But I also drink a lot because I want to stay well hydrated. I just hang a “P” jug from the hammock support line so I can go in the night without leaving the hammock or leaving a steamy wet area under it. Works very nicely. Simple aging is also a factor. I used to sleep through the night, but as I get older, I find that I wake up and usually need to go. I also find that I need to go more often in cold weather than in warm weather when sweat is a factor. I’m a 365 hanger and i never thought about this before now.. When I’m out on a cycling trip hanging I normally have to pee during the night, but when I’m hanging at home I almost never get woken up by the urge to pee.. So coming from someone who sleeps every night in a hammock, a hammock does not make me pee, it’s the other things that cause it. Thanks, that is great feedback. I think you are correct, especially when adding the complexity of physical activity and exertion. As I mentioned in the post, fluid build-up and extra hydration are components. The hammock plays a part, but isn’t the cause, per se. It is the combination of factors. One thing the males can do, is to have a large plastic pee bottle with a screw on cap. I use an Arizona Tea bottle which has a relatively wide mouth opening. I spent 3 nights hammock camping in mid 30 degree weather, so I certainly didn’t want to get out of the hammock each time nature called. Whenever I felt the urge, I removed the bottle from the stuff sack attached to my hammock, took the cap off the bottle, then held it at a downward angle to avoid spilling, placing the bottle opening right where I needed it, while lying on my back. When I finished, I put the cap back on, and placed it back in the stuff sack. I could pee 2-3 times before the bottle got too full, without ever spilling a drop. Once the bottle got near full, I simply dumped it out on the ground, then put the cap back on until the next use. The bottle can also be used to warm your hands in cold weather. I bring one every time I kayak, hammock camp, as well as keep one in my vehicle in case of emergencies. I also need to pee several times each night, even in a regular bed (and often during the day too, doc says it comes with being 65) and use a pee-jar to avoid getting out of bed. I get on my hands and knees to pee in the jar, and wonder if a camping hammock is stable enough for that position. Never tried a pee-jar while laying on my back, hard to imagine that, but I will try. I succeeded in peeing while on my back! Cool, problem solved by the info in this great site, thank you!